A recent study of Fortune 500 CEOs found that 61% have no public-facing social media presence. Moreover, of those leaders who are engaged, 70% have accounts on only one network. This failure by executives to not fully engage on social media is a huge mistake. Social networks have become essential to the lives of consumers, and they now expect business leaders to be on these platforms. Some 64% of Americans say they like CEOs to engage on social media because it helps them to better understand businesses, and 54% believe that executives who engage on social media are more trustworthy. In other words, it’s time for CEOs to dive deeply into social media. So, where’s the best place to start? Which networks are the right ones to focus on? What are the keys to connecting with audiences? The new e-book from MDG Advertising, “The CEO’s Guide to Social Media: How to Succeed in 4 Simple Steps,” explores a few things leaders can do to make the most of their social efforts. The complimentary e-book is based on what we’ve seen work with our own clients, as well as other exceptional CEOs. Starting with LinkedIn: The business network is the most popular with CEOs for a good reason; find out how to make the most of your profile and optimize your presence. Picking other networks: CEOs can’t be on every network beyond LinkedIn, but they should be on some; learn how to determine which are the right ones for you. Sticking with it: Posting regularly and frequently is the key to social media success; understand why this consistency is absolutely essential. Avoiding being boring: Social posts from CEOs are often dull, despite the executives being personally engaging; find out how to avoid this huge pitfall. 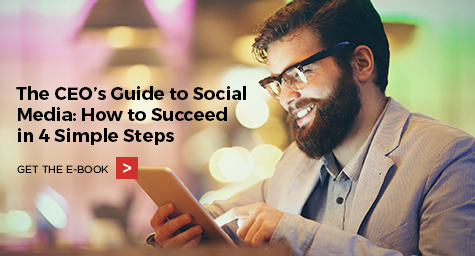 Check out the full e-book for in-depth exploration of how each of these steps can help you achieve social media success. Turn social media into a fast track for reaching your company’s goals. CEOs can no longer afford to ignore social media. Putting a human face on your company is essential to its success. By establishing a presence on the right platforms, you can engage current and potential customers, attract the best employees, establish a stronger media rapport, and more. In “The CEO’s Guide to Social Media: How to Succeed in 4 Simple Steps,” you’ll quickly learn what you need to know to make social media second nature. I'd like to receive more updates! Discover the latest social media tactics. Contact MDG Advertising today at 561-338-7797.